downtown Santa Barbara Public Library, 40 East Anapamu St, Santa Barbara, CA, 93101. Donation of $15-$20, no reservations needed. 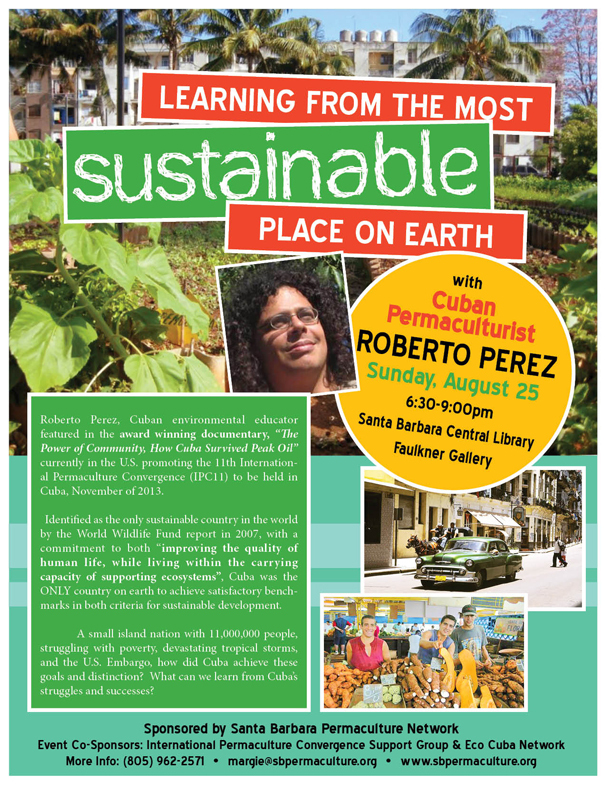 Roberto Perez, Cuban environmental educator featured in the award winning documentary, "The Power of Community, How Cuba Survived Peak Oil" currently in the U.S. promoting the 11th International Permaculture Convergence (IPC11) to be held in Cuba in November of 2013. The Living Planet Report from the World Wildlife Fund in 2007 identified Cuba as the only sustainable country in the world. The study involved two key parameters for measuring sustainable development, a commitment to "improving the quality of human life while living within the carrying capacity of supporting ecosystems". Cuba was the ONLY country on earth to achieve satisfactory benchmarks in both criteria for sustainable development. Formerly importing most of its food, Cuba's agriculture is now 95% organic, with the city of Havana producing over 60% of its own fruits and vegetables within the city's urban spaces. At the same time, Cuba has been engaging in a massive reforestation campaign, and has invested massively in alternative energy production, with a focus on solar and biofuels. A small island nation with 11,000,000 people, struggling with poverty, devastating tropical storms, and the U.S. Embargo, how did Cuba achieve these goals and distinction? What can we learn from Cuba's struggles and successes? the oldest environmental organization in Cuba. 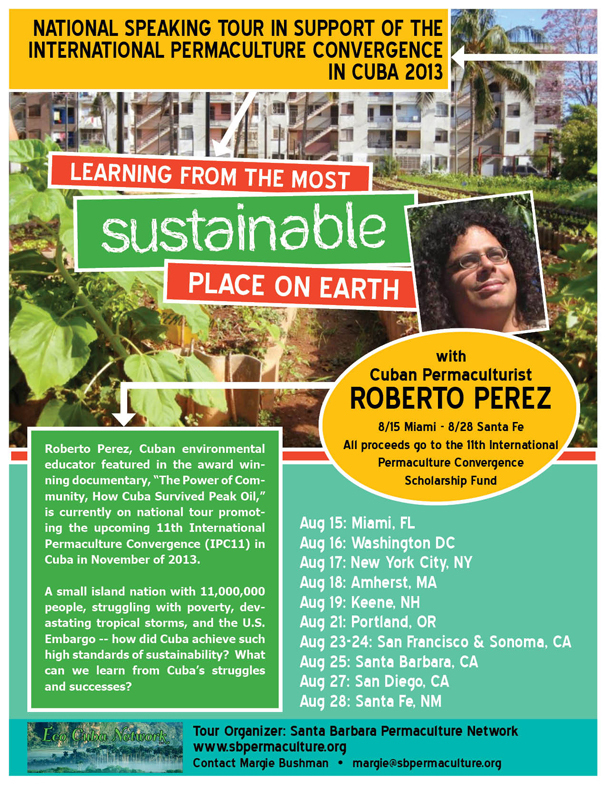 Eco Cuba Network has been asked by the 11th International Permaculture Convergence (IPC 11), International Support Group to provide assistance to U.S. citizens to participate in the International Permaculture Convergence in Havana, Cuba, November 24 ­ December 6, 2013. Donations of $10-$20, no reservations needed. No reservations needed. Please carpool! 6:30pm Santa Barbara Public Library, 40 East Anapamu St, Santa Barbara, CA, 93101. 6:30 -9pm, at The Shed, La Loma Development, 1355 Lincoln Ave. There is an early bird discount of 10% for those that register before July 31! Permaculture has for more than 30 years been an innovative system of techniques based on the best practices of traditional cultures of the planet, knowledge learnt from Nature and its ecosystem functioning and the adoption of new technologies that are ecologically friendly. All of this, combined with deep ethics and design principles to integrate the different dimensions of sustainability in human settlements ­ like energy, water, transportation, financing, human communities and other issues ­ makes Permaculture a unique experience for those that have been practicing it since the late 1970s. Island people have been very active with the development of Permaculture; it all started in Tasmania and was established in New Zealand soon after. These limited territories with finite resources, distinctive cultures, relatively low biodiversity and high endemism, are ideal for the development of Permaculture systems. But island territories are also the most affected and threatened by extreme climate change events, high population densities, loss of traditional languages, techniques and cultures, and the worst trends of globalization ­ like the destruction of natural resources and the extension of big corporations and destructive forms of tourism. Cuba, that started using Permaculture in 1993, brought in solidarity by Australian activists, has been accumulating experience and our Permaculture movement has integrated efforts with other important groups in the country, like Agroecology, urban agriculture, traditional knowledge rescue and others. This is also all within the framework of an environmental policy that puts priority on conservation and reforestation, promoting development with low energy use and low greenhouse gas emissions, and a dignified form of life for Cubans based on universal access to basic services like health, sports, culture, education and healthy food. We hope to share our modest achievements with the worldwide Permaculture community, with emphasis this time on islands and urban territories and its challenges. Traditionally IPCs are held every two years and switch between continents. Past host sites have been Australia, USA, New Zealand, Nepal, Scandinavia, Croatia, Brazil, Malawi and Jordan. We are looking forward to seeing you in Cuba this November!! The IPC11 Cuba Organizing Group. With a Highly qualified team of Professors from USA, UK, Canada and Cuba. With many important Permaculturists already confirmed to present. There is still space for presentations at the Convergence, please contact us. Three choices that include the provinces of Matanzas and Sancti Spíritus and the best preserved traditional Spanish Villa in Cuba, Trinidad. For all the information, including prices and payments, in English and Spanish, please check www.ipc11cuba.com. IPC11 Cuba 26 Nov. - 6 Dec. 2013: Call for Presentations. Do you have something to share? The IPC11 Cuba Organising Committee has issued a "request for presentations" from interested permaculture leaders who would like to make a presentation, demonstration, workshop etc at the Convergence this November. 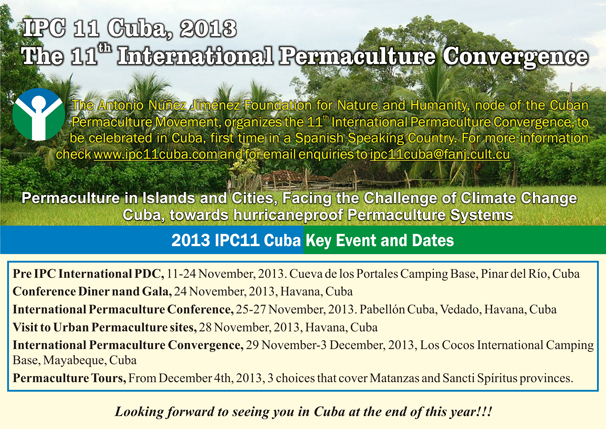 Simply send an email at info@ipc11cuba.com, ASAP before August 2013, outlining your proposal, including the topic of your presentation and a little about your background in permaculture. Presentations are between 45 mins and 1 hour in length. If you require a longer period for your presentation, feel free to request it. for more information, please call (805) 962-2571, margie@sbpermaculture.org. 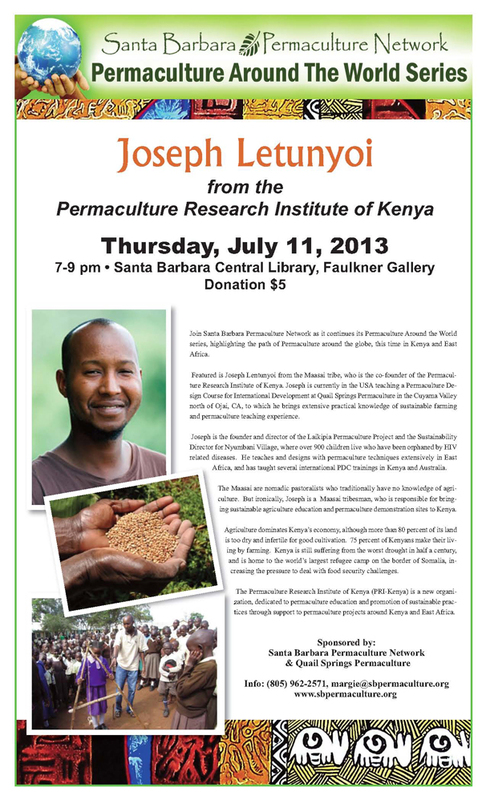 Join Santa Barbara Permaculture Network as it continues its Permaculture Around the World series, highlighting the path of Permaculture around the globe, this time in Kenya and East Africa. Featured is Joseph Lentunyoi from the Maasai tribe, who is the co-founder of the Permaculture Research Institute of Kenya. Joseph is currently in the USA teaching a Permaculture Design Course for International Development at Quail Springs Permaculture in the Cuyama Valley north of Ojai, CA, to which he brings extensive practical knowledge of sustainable farming and permaculture teaching experience. Joseph is the founder and Director of the Laikipia Permaculture Project and the Sustainability Director for Nyumbani Village, where over 900 children live who have been orphaned by HIV related diseases. 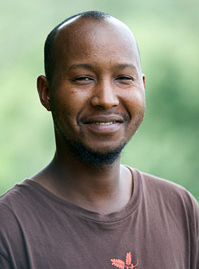 He teaches and designs with permaculture techniques extensively in East Africa, and has taught several international PDC trainings in Kenya and Australia. He attended the Kenya Institute of Organic Farming and Uganda Martyrs University in Agriculture. The Maasai are nomadic pastoralists who traditionally have no knowledge of agriculture. But Joseph ironically, is the Maasai tribesman who is bringing sustainable agriculture education and permaculture demonstration sites to Kenya after a Permaculture Design Course in Tanzania in 2007 with Australian permaculture teacher Geoff Lawton. Agriculture dominates Kenya's economy, although more than 80 percent of its land is too dry and infertile for good cultivation. According to the Ministry of Agriculture, farming is the largest contributor to Kenya's gross domestic product, and 75 percent of Kenyans made their living by farming in 2006. Kenya is still reeling from the worst drought in half a century, which affected an estimated 13 million people across the Horn of Africa in 2011. Kenya is also home to the world's largest refugee camp, housing 450,000 Somalis fleeing violence and famine, increasing the pressure to deal with food security challenges. The Permaculture Research Institute of Kenya (PRI-Kenya) is a new organization, dedicated to permaculture education and promotion of sustainable practices through support to permaculture projects around Kenya and East Africa. Event Sponsors: Common Ground Center at UCSC's Kresge College & the Cabrillo College Permaculture Club. Author signed books available for sale at the event. 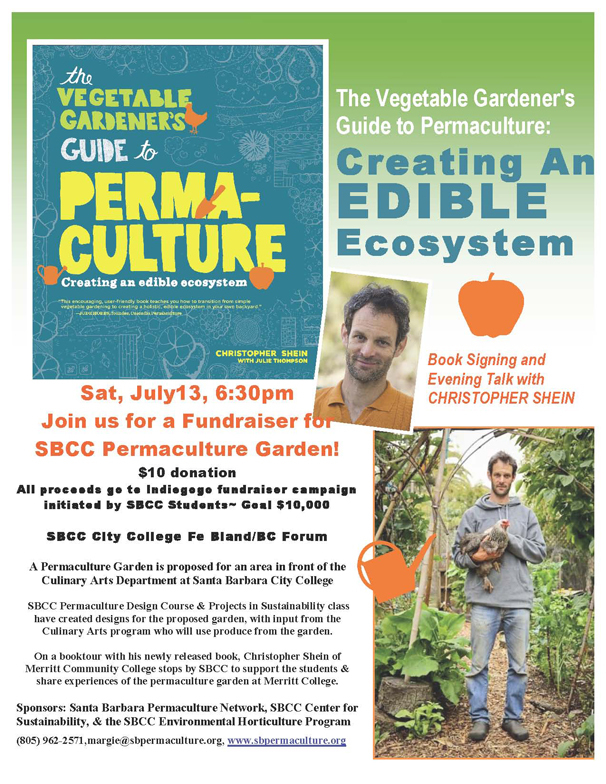 On Saturday, July 13, Santa Barbara Permaculture Network hosts a book signing event with author Christopher Shein and his newly released book, The Vegetable Gardener's Guide to Permaculture, as a fundraiser to support Santa Barbara City College students and their online campaign to raise funds for a Permaculture Garden at Santa Barbara City College (SBCC). Inspired by an event earlier in the year at SBCC with Ryan Harb from the University of Massachusetts Amherst, whose Permaculture Your Campus garden project won national recognition with a Champions of Change Award at the White House in 2012, students attending the workshop decided they wanted to create something similar at SBCC. The proposed permaculture garden would be located in front of the SBCC Culinary Arts Department. Both the SBCC Permaculture Design Course class & the Projects in Sustainability class have already created designs for the garden, with input from the Culinary Arts program, who will use produce from the garden. On a statewide booktour organized by Santa Barbara Permaculture Network, Christopher Shein stops by SBCC to support the students & share experiences of the permaculture garden & food forest at Merritt Community College in Oakland, California, where he teaches. Prior to creating his book, Christopher spent 20 years in the East Bay as a garden designer applying permaculture design principals to build public and private sustainable gardens and food forests with his landscape business, Wildheart Gardens. With students, he founded the Permaculture Demonstration Garden at Merritt College in Oakland 11 years ago to show ideas for sustainable food gardens as applied in California's dry summer climate. More than 700 students have helped create a wildly productive food forest. The Vegetable Gardener's Guide to Permaculture is an inspiring, easy-to-follow, information packed guide that is designed to help readers transform their home & community gardens into productive food forests that will feed them for years to come. Permaculture is an ancient, but cutting edge technology, that employs design strategies that work with nature, instead of relying on back breaking work, fertilizers, herbicides, and pesticides. The permaculture gardener uses methods that build healthy soil, smothers weeds, and promotes plant life, while recycling waste products from the garden. $5 donation, no reservations required. 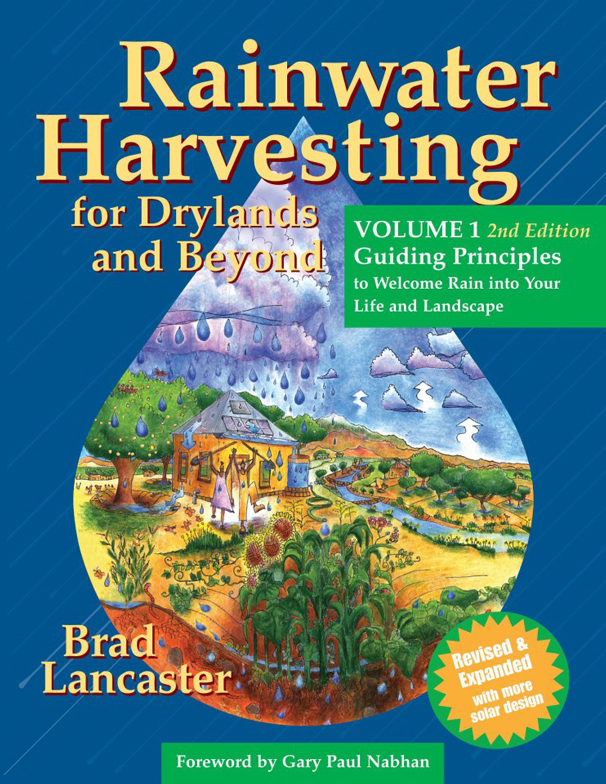 Rainwater Harvesting expert Brad Lancaster returns to Santa Barbara with his newly published 2nd Edition of his award winning, best selling book Rainwater Harvesting for Drylands; Turning Water Scarcity into Water Abundance, Vol. 1, 2nd Edition on Tuesday, June 25. Brad's books have always encouraged readers to turn water scarcity into water abundance by welcoming rain into our lives, landscapes and soils. In this newly updated 2nd edition, Brad updates real life case studies for harvesting rainwater, completely renovates the approach to seeing & understanding sediment flows, and adds more tools for harvesting rainwater and other often overlooked free on-site resources, such as wind, sun, and shade. Rainwater harvesting is the process of capturing rain and making the most of it as close as possible to where it falls. By harvesting rainwater on the land within the soil and vegetation, or in cisterns that will later irrigate the land, it is possible to control erosion, reduce flooding, and minimize water pollution. This practice is enormously beneficial in a world with a finite supply of fresh water that is becoming increasingly polluted. Although rainwater harvesting has been accomplished by humans in virtually every drought vulnerable region of the world for millennia, our society, until very recently with the help of people like Brad Lancaster, seemed to have a collective amnesia about the utility, efficiency, and beauty of rainwater harvesting practices. Brad Lancaster is an author, permaculture teacher, designer & consultant, and co-founder of Desert Harvesters (DesertHarvesters.org). Brad has taught programs for the ECOSA Institute, Columbia University, University of Arizona, Prescott College, Audubon Expeditions, and many others. He has helped design integrated water harvesting and permaculture systems for homeowners and gardeners, including the Tucson Audubon Simpson Farm restoration site; the Milagro & Stone Curves co-housing projects. Brad lives on an eighth of an acre in downtown Tucson, Arizona, where annual rainfall is less than 12 inches. He practices what he preaches by harvesting over 100,000 gallons of rainwater a year, and with his brother Rodd, have created an oasis in the desert by directing harvested rainwater into a thriving landscape that includes abundant gardens, food bearing trees, and habitat for wildlife, instead of into the streets and storm drains of Tucson. All events at Fe Bland Auditorium/BC Forum on the Santa Barbara City College West Campus, 800 Block of Cliff Drive, Santa Barbara, CA, 93109. No reservations required except for the Zero Waste Workshop. Parking is free on the West Campus on weekends. Tourism is the largest industry in the world, and cities by far the largest creation of humanity. In a world with less resources and more people, how can we use human ingenuity to design a future in balance with nature? Luckily many have begun. Please join us as our keynote speaker Mark McGuffie shares inspiring and concrete examples of innovations from around the world, with his unique insights as the convener for The World Congress on Zero Emissions Initiatives - Launching "The Blue Economy” in 2010, where he hosted innovators & leaders in sustainability practices from places like Bhutan, the Canary Islands, Colombia, Japan, Sweden, and many others, while also sharing the ancient traditions and cultural values that his home of Hawai‘i demonstrates with the spirit of "Aloha". First defining "What is Sustainable Tourism", McGuffie continues his talk by sharing Blue Economy inspired innovations already being implemented as solutions around the world. By designing with nature, Blue Economy innovations go beyond sustainability and are based on whole systems thinking, that save energy, create jobs, and eliminate waste. about Sustainable Tourism for the 21st Century, please join us! 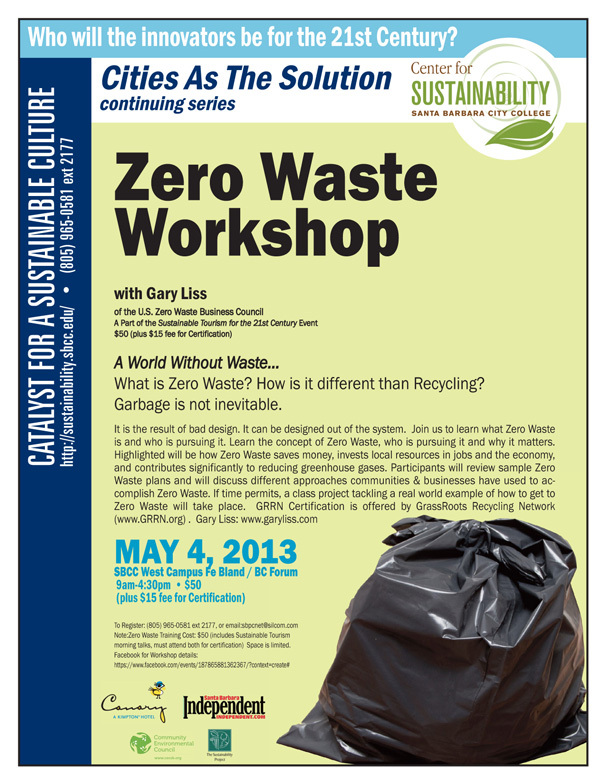 Of special note, an opportunity to take a Zero Waste Workshop with Gary Liss of the U.S. Zero Waste Business Council as a part of the all day Saturday program on May 4, see details below. part of the Kimpton Hotel & Restaurants, pioneers in Sustainability since 1981. Event Co-Sponsors: The Canary Hotel, SB Independent, Community Environmental Council (CEC), Santa Barbara Car Free, BackYard Bowls, Santa Barbara Permaculture Network, Vivi Teston~Fleur de V, and The Sustainability Project. Friday Evening, 7-9:30pm May 3, Keynote speaker, Mark McGuffie, Managing Director of Enterprise Honolulu- O'ahu Economic Development Board, and convener of the The World Congress on Zero Emissions Initiatives - Launching "The Blue Economy”, in Honolulu in September 2010. Followed by a panel of community members: Dave Davies of the Community Environmental Council (CEC), Caroline Dyal, from the Canary Hotel, Frances Gilliland, from the Green Business Program of Santa Barbara County, Steve Cushman former president of Santa Barbara Chamber of Commerce & currently serving with the Foundation for Santa Barbara City College, and SBCC Culinary Arts & Hotel Management student. Saturday, May 4, all day program includes plenary talks in the morning with three speakers, followed by break out sessions in the afternoon. Caroline Dyal, General Manager of the Canary Hotel in downtown Santa Barbara, part of Kimpton Hotel & restaurants, pioneers in sustainability practices since 1981, including an Earth Care program. Gary Liss, of Gary Liss & Associates, Former Mayor of Loomis, CA, President of the U.S. Zero Waste Business Council, convener of the National Zero Waste Business Conference in Cincinnati, Ohio, May 2013. The afternoon break out sessions on Saturday, May 4, includes an opportunity to take a Zero Waste certification training with Gary Liss, who has done trainings for community colleges, businesses and cities around the country, most recently Whole Foods. 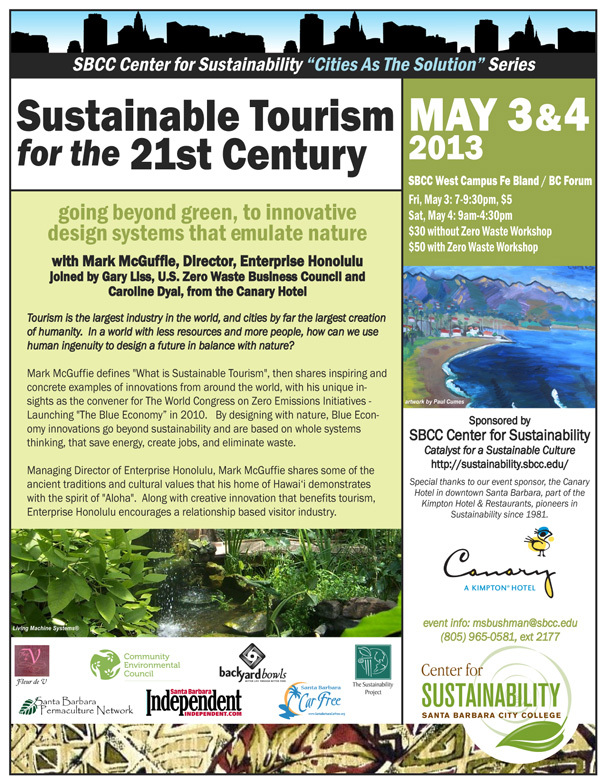 Mark McGuffie & Caroline Dyal of the Canary Hotel, will meet with others who want to learn more about sustainability practices for tourism, and ask Mark more about Blue Economy innovations . Note on Subject Line: Zero Waste Training, email to: Margie Bushman, Center for Sustainability: msbushman@sbcc.edu. Training Cost: $50 (includes the morning talks, must attend both for certification) Space is limited. Mark McGuffie is Managing Director of Enterprise Honolulu, the O‘ahu Economic Development Board, a private non-profit organization established in 1988 which envisions a prosperous Hawai‘i. Practicing, sharing and living the values of Aloha and Malama, provides the insight and guiding light to care for Hawai‘i and its future. Much of his expertise is directed toward rethinking Environmental System Design - Blue Economy Innovations integrating Food and Clean Energy Initiatives, Sustainable Tourism and Community Leadership Development. He was most recently the United States representative for the Program Committee of Congress at the World Conservation Congress for the International Union for the Conservation of Nature (IUCN) held in Jeju, South Korea in September 2012. McGuffie was formerly the Executive Director of Hawai‘i Island Economic Development Board, Chair - Workforce Investment Board, Treasurer of Preferred Hotels and Resorts Worldwide including 104 independent luxury hotels and resorts in 52 countries and managed hotels several of them over the years, namely: the UN Plaza in New York City, Checkers Hotel in Los Angeles, opened The Manele Bay on Lanai and managed the Mauna Lani Bay Hotel on the Kohala Coast, Hawai‘i. His extensive tourism background of nearly 35 years in luxury hotel and resort operations included assignments in the UK, France, Canada, Singapore, Caribbean and across the United States. He attended Cornell University for Professional Management Development. "Today, Hawaii’s brightest minds are looking to combine the latest modern technology with traditional ways of managing the islands’ resources in order to live sustainably. Enterprise Honolulu is a non-profit organization that facilitates work on Hawaii’s infrastructure and planning issues in order to move the state towards energy independence and food self-sufficiency. One of the goals of The World Congress on Zero Emissions Initiatives was to realize that it is possible to achieve abundance in our systems for human needs in the areas of energy, food, health, housing, transportation, waste, and water by using what we have. Today, systems in these areas are not fully integrated, they are often wasteful and designed in silos, rather than using an inclusive process. This is a time to come together with experts and people from around the world interested in solutions to learn and share about innovations that are proven." Gary Liss has over 38 years of experience in the solid waste and recycling field. Mr. Liss is now President of Gary Liss & Associates. Mr. Liss is a leading advocate of Zero Waste and has helped more communities develop Zero Waste plans than anyone else in the U.S., including: Los Angeles and Oakland, CA; Austin (TX); Telluride (CO); and the Big Island of Hawaii. Mr. Liss is President of the new US Zero Waste Business Council. He was a founder and past President of the National Recycling Coalition. He is a founder and Boardmember of the Recycling Organizations of North America and the GrassRoots Recycling Network, and a leader of the Zero Waste Brain Trust. Mr. Liss went through extensive training with Gunter Pauli in Zero Emissions Research & Initiatives and is a Certified ZERI System Designer. Mr. Liss was also Solid Waste Program Manager for the City of San Jose, Resource Recovery Director for the U.S. Conference of Mayors and Assistant Administrator for Alternate Technology for the New Jersey Department of Energy. Since 2008 he has served on the Town Council in his hometown of Loomis, CA and was Mayor in 2010. He has a Masters in Public Administration from Rutgers University and Bachelor in Civil Engineering (Environmental Engineering major) from Tufts University. Carolyn Dyal brings more than a decade of experience in hospitality management with her to Canary, working at a number of renowned boutique hotels, including Hotel Palomar in Los Angeles, Viceroy in Santa Monica, Chamberlain, West Hollywood, Avalon Hotel in Beverly Hills, and most recently before coming to the Canary in Santa Barbara, Kimpton's Hotel La Jolla. Dyal began her hospitality career in food and beverage and quickly progressed to managerial and training capacities at such prestigious establishments as the Palm Restaurant and Disney's Grand California Hotel. Dyal holds a bachelor’s degree in fine arts from New York University. Living Machine® Systems found in these buildings: El Monte Sagrado Resort, Taos, NM; Esalen Institute, Big Sur, CA; San Francisco Public Utilities Commission, San Francisco, CA. Living Machine® Technology blends cutting-edge science and engineering with plants and beneficial bacteria to efficiently treat and reuse wastewater, providing lasting water solutions for communities everywhere. Based on the principles of wetland ecology, our patented tidal process cleans water, making the Living Machine® the most energy-efficient system to meet high quality reuse standards. At a glance, the Living Machine® system incorporates a series of wetland cells, or basins, filled with special gravel that promotes the development of micro-ecosystems. As water moves through the system, the cells are alternately flooded and drained to create multiple tidal cycles each day, much like we find in nature, resulting in high quality reusable water. What Exactly Is Sustainable Tourism? The concept of sustainable tourism is a confusing one, often mistaken for other environmental related concepts like ecotourism or geotourism. While similar, there are inherent differences, the California Sustainable Tourism Summit Planning Document should help clarify the key differences between sustainable tourism, ecotourism and geotourism. Sustainable tourism is generally defined as tourism activities that create a net benefit for the economic, social, cultural and natural environments of a destination. No one element should trump another. No charge, but donations gratefully accepted. Refreshments will be served. This will be a time for sharing our community-building and cooperative projects, and inviting each other to participate in visions and ventures that bring meaning to our lives. Hear about local cooperatives that are active in our community as well as emerging organizations and ideas. There will be an opportunity for each of us to get involved in exploratory circles to discuss various projects or issues we want to share with others. We will also learn about follow up cooperative events. Each of us can contribute as much or as little to the conversation as we are moved to do in the moment. a newly forming local group that is focused on cultivating collaborative community. Shift Change: Putting Democracy to Work is a new documentary that highlights worker-owned enterprises in North America and in Mondragon, Spain. The film couldn't be more timely, as 2012 has been declared by the U.N. as the "International Year of the Cooperative." To pre-register for this event please send an email to Ben Werner sb@monetaryecology.com with the subject line "registration request" and you will receive the event invitation with registration instructions. Spend an evening with international currency expert Bernard Lietaer and award-winning journalist Jacqui Dunne as they share their new book Rethinking Money, How New Currencies Turn Scarcity Into Prosperity. Learn about our power as communities to create money through exchanges that improve our quality of life in tangible ways. Complementary Currencies will be presented as a proven out-of-the-box solution to the rapidly growing international fiscal and economic crises, and as a means to create new community liquidity and sustainability. 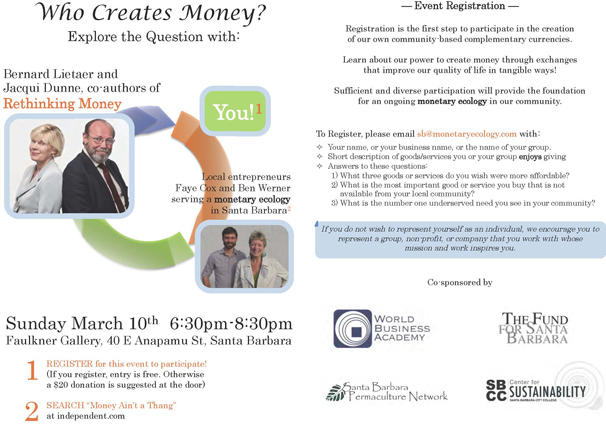 Local entrepreneurs Faye Cox and Ben Werner will share an opportunity to participate in a new Community Forum, whose purpose is to design and implement a Monetary Ecology in Santa Barbara and beyond. This event will be of particular value to locally-minded entrepreneurs, non-profit groups, companies, and all culturally-creative folks interested in new forms of community economic exchange and value creation. Bernard Lietaer is a former Belgium banker and the author of several highly acclaimed books including The Future of Money: Beyond Greed & Scarcity; and Creating Wealth; Growing Local Economies with Local Currencies, and , New Money for a New World. He has been active in the realm of money systems in a wide variety of functions for almost 40 years, including being one of the principle architects of the European euro. Formerly a professor of international finance at the University of Louvain, Lietaer was a fellow at the Center for Sustainable Resources at the University of California, Berkeley. Lietaer co-founded one of the largest and most successful currency management firms, GaiaCorp. He is co-founder of ACCESS Foundation, an educational non-profit organization whose goal is the re-alignment of sustainability and global financial interests. Business Week magazine named him "the world's top currency trader" in 1992. Jacqui Dunne is an award-winning journalist from Ireland, founder and CEO of Danu Resource, and an emerging leader in helping entrepreneurs develop technologies and initiatives that restore the earth's equilibrium globally. She is a principal strategist with the launching of the business to business currency, the terra, that is designed to create more stability and predictability in the financial and business sectors by providing a mechanism for contractual, payment and planning purposes worldwide. She is currently writes for the Huffington Post's Business section. Bernard Lietaer and Jacqui Dunne explore the origins of our current monetary system­built on bank debt and scarcity­revealing the surprising and sometimes shocking ways its unconscious limitations give rise to so many serious problems. But there is hope. The authors present stories of ordinary people and their communities using new money, working in cooperation with national currencies, to strengthen local economies, create work, beautify cities, and provide education­and so much more is possible. These real-world examples are just the tip of the iceberg­over 4,000 cooperative currencies are already in existence. The Food Commons model is a new economic paradigm and whole system approach for regional food. The Food Commons envisions a re-creation of the local and regional food systems that preceded the current global industrial food systems, updated to reflect 21st-century advances in information systems, communications, community-based organizational and economic models, the science and practice of sustainable agriculture and the changes in culture and demand. 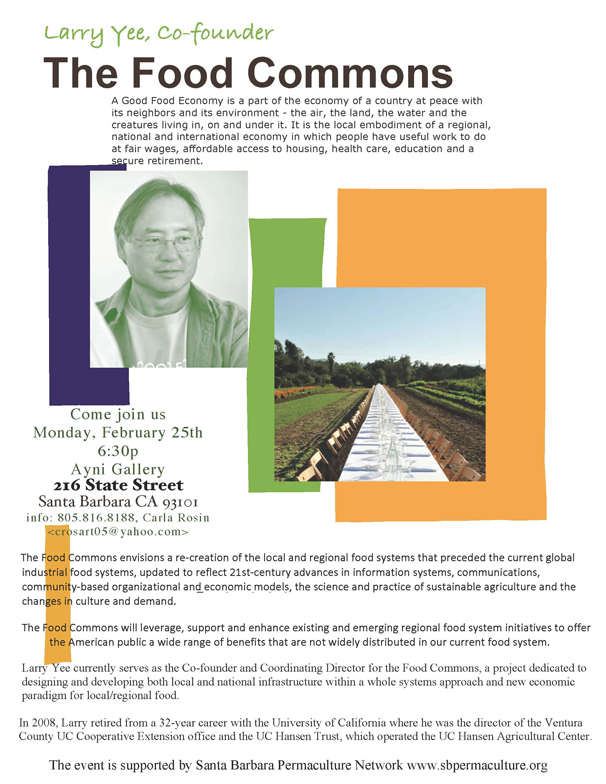 Join Larry Yee Co-founder and Coordinating Director for the Food Commons http://www.thefoodcommons.org/ as he talks about The Food Commons a project dedicated to designing and developing both local and national infrastructure within a whole systems approach and new economic paradigm for local/regional food. A Good Food Economy is a part of the economy of a country at peace with its neighbors and its environment - the air, the land, the water and the creatures living in, on and under it. It is the local embodiment of a regional, national and international economy in which people have useful work to do at fair wages, affordable access to housing, health care, education and a secure retirement. In 2008, Larry retired from a 32-year career with the University of California where he was the director of the Ventura County UC Cooperative Extension office and the UC Hansen Trust, which operated the UC Hansen Agricultural Center. In a workshop designed for students and others interested in effecting change in their communities and campuses, Ryan Harb will share detailed action plans from the UMass Permaculture Initiative and Permaculture Your Campus! conference in 2012. For businesses or institutions trying to become more sustainable, this workshop is for you. Permaculture campuses are a trend...that all campuses will be doing in the future...but the time to act is now! The award-winning University Massachusetts Amherst Permaculture Initiative is a unique and cutting edge Sustainability program that converts unproductive grass lawns on the UMass Amherst campus into ecological, socially responsible, and financially sustainable permaculture landscapes that supply healthy organic food to the UMass dining commons. A part of a larger transition into a more ecological campus culture, that includes waste reduction, energy conservation, and eco-social responsibility, the UMass Permaculture Initiative was the recipient of the White House Champions of Change Award in 2012. 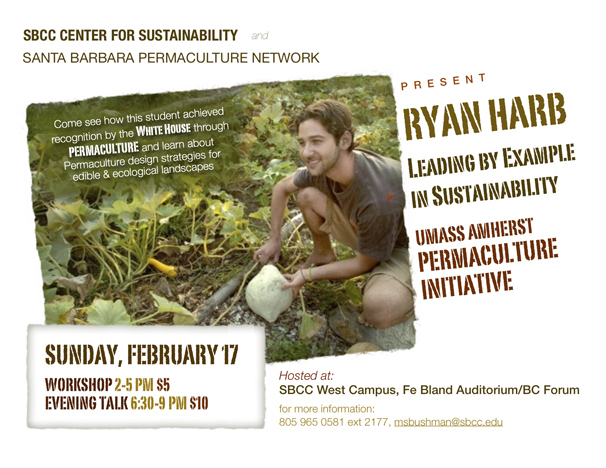 Join Ryan Harb as he shares the remarkable success of the UMass Permaculture Initiative using Permaculture design strategies that are replicable and adaptable to any organization, on virtually any budget, for any climate. Permaculture landscapes are environmentally beneficial, save money, increase student & employee satisfaction, and ultimately attract new economic opportunities with awards, grants, crowd funding, and alumni donations. All institutions with campuses or grounds will benefit from having ecological and edible landscapes. Ryan Harb is Certified Permaculture Designer, Instructor, UMass Amherst faculty member, LEED Accredited Professional, with a BBA in Business Management and the first person in the nation to hold a Master of Science degree in Green Building. Harb is currently designing a new academic program at the University of Massachusetts that empowers students to become change-makers in the world and be creators of a new sustainable culture. A Permaculture Your Campus! conference was convened in 2012, and will be offered again June 2013. The UMass Permaculture Initiative has been featured in the New York Times, the Boston Globe, Huffington Post, and featured on both MTV and the WhiteHouse.gov website. 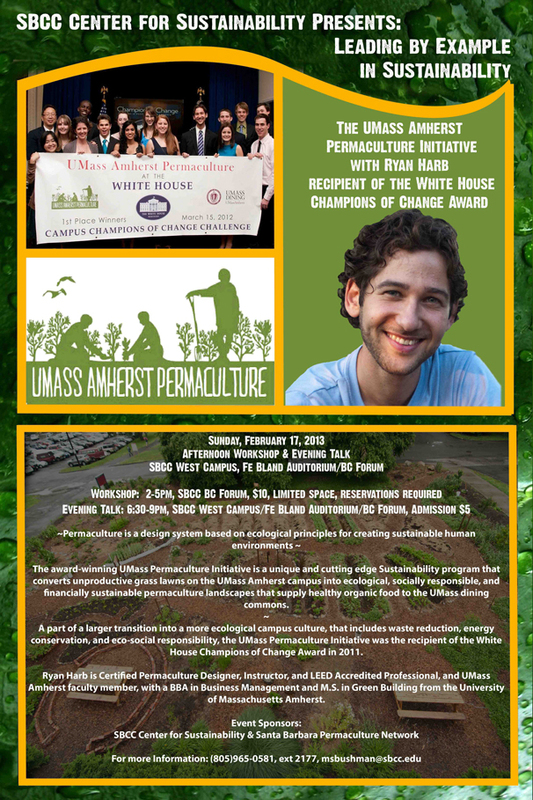 UMass Permaculture wins White House Campus Champions of Change Challenge! Ryan Harb of the University of Massachusetts Amherst will be speaking at Cal Poly San Luis Obispo, 3-5pm Room UU220. Permaculture Campus Design for Socially Engaged and Ecologically Sound Communities: Case Study of UMass Amherst, with Ryan Harb. Sponsored by the SLO Permaculture Guild, Cal Poly CAFES Center for Sustainability, & Poly Permaculture. Early Bird Discount: Register before February 1 for only $600! Proceeds benefit Native Seeds/SEARCH. Full payment is due two weeks prior to the starting date. Space is limited - sign up early! Payment can also be made by mailing a check payable to Native Seeds/SEARCH, 3584 E. River Road, Tucson AZ 85718. 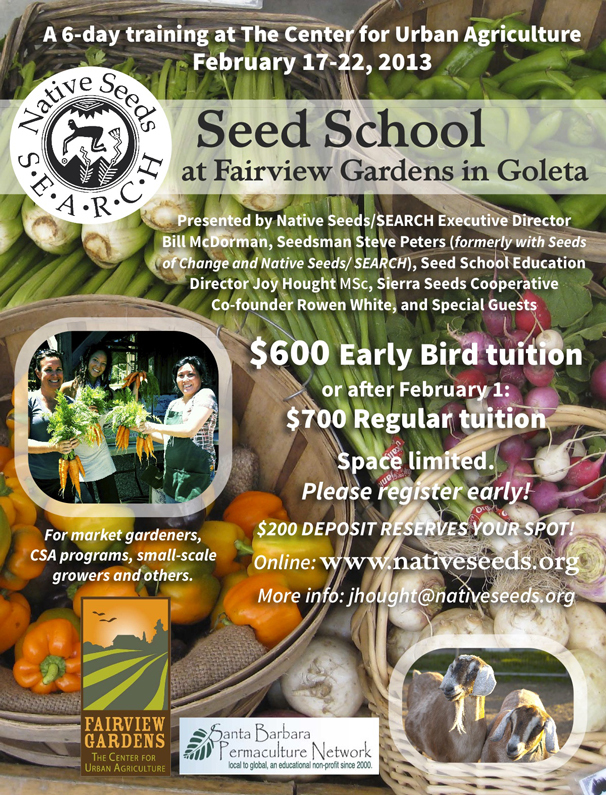 Indicate "Seed School - Fairview Gardens 2013" on your check and include contact information and phone number. After making your deposit, please click here to complete your registration. As awareness grows around issues of food and sustainability, people everywhere are waking up to the vital importance of seeds. Now more than ever, we need small, bioregional seed operations to replace the "one-size-fits-all" industrial seed system. To answer this need, Native Seeds/SEARCH has created Seed School. Seed School is a groundbreaking 6-day course designed to help participants create new regional and sustainable seed production and distribution systems. Students walk away from this innovative educational program with the knowledge and inspiration to start their own heirloom seed company, organize a community seed-lending library, and train others in the art and practice of seed saving. 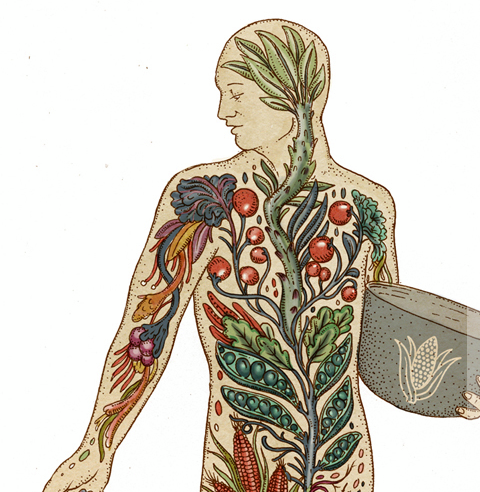 Seed School is for gardeners, farmers, seed savers, entrepreneurs, NGOs, policymakers and anyone interested in turning the tide on the industrialization of our food and agriculture. When our ancestral gardeners needed seed, there were no glossy catalogs to leaf through. They acquired their replanting stock through the time-honored practice of seed saving, a tradition dating back some 10,000 years. But today most farmers and gardeners purchase their seed from "Big Box" chains and corporate seed companies. This dramatic shift has taken its toll. Over the past century, we've lost an alarming amount of biodiversity among our food crops and become dependent on an industrialized agricultural system that puts profits above all else. Seed School encourages a return to the ancient art of seed saving to reconnect people from all walks of life with seeds—the source of all sustenance. We envision a vast network of thousands of small, bioregional seed companies and community-owned seed collections replacing the disempowering and ecologically destructive industrial system. By taking ownership over our seeds once again and rejoining the ritual of seed saving, we are replenishing our dwindling biodiversity, building up beneficial crop adaptations, and strengthening food security where we live. This is the way to true sustainability... and to healthier, better-tasting food! This first-of-its-kind course teaches the practical, detailed information necessary to recreate the genetic foundation for a truly sustainable agriculture. Seed School's focus is to dissect the current world seed situation, take a hard look at its implications, and then help students gain the skills needed to construct new seed production and distribution models for both profit-making and nonprofit institutions. Classroom time in this permaculture-inspired program is balanced with hands-on activities, group work, and consulting time with our expert instructors. For our Tucson courses, a field trip to the 60-acre Native Seeds/SEARCH Conservation Farm offers students a unique window into a professional seed conservation organization at work. Click here to download the full Seed School syllabus. Bill McDorman is the principal instructor for Seed School and the Executive Director of Native Seeds/SEARCH, a 29-year-old Southwestern seed conservation organization based in Tucson, Arizona. He is the founder of three seed companies and several nonprofits, and author of the 1994 book Basic Seed Saving. Joy Hought has a unique combination of expertise including 15 years teaching and developing curricula in the arts and sciences; 2 years in public broadcasting; and a graduate degree in seed science, crop genetic conservation, and food systems. and many other amazing speakers! $50.00 Early-Bird Special! Available till 01/31/2013! Price will go up if you wait. 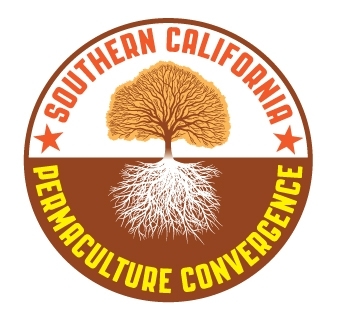 We San Diego Permies are excited to be hosting the Southern California Permaculture Convergence in 2013. This event will draw people from all Southern California, and it is going to be an amazing, inspirational, mind-bending permaculture event. :: Lots of hands-on workshops and more! An exact transparent accounting of all of our $ transactions can be seen by clicking here. If you are unable to pay (you may have a family of 4 and you all want to come, in that case, it does add up! ), please contact us to contribute other ways. We are offering a work-exchange. We need you, want you, and nobody is turned away for inability to pay! Cancellation Policy: A full refund can be issued upon written request up to 20 days before the event. Within 20 days of the event, no refunds will be issued. We will have food vendors on site for different dietary needs. Vendors will be available both Saturday and Sunday for lunch, and Saturday for dinner. You will have to take care of other meals yourself, we have provided a list of local grocery store and dining options under the Staying With Us Tab. Tent camping on site will be on a first come, first serve basis. Please bring $10 cash to check-in, and note that we are located in a burn-ban area so bring a propane stove if you are planning on cooking. No pets are allowed. No smoking or alcohol allowed. Harmony Grove also has cabins for rent from $30 to $60/night for two people. You can reserve one through them at either hgsa@nethere.com or by phone at (760) 745-9176. No smoking or alcohol allowed, but pets are welcomed here! Since camping space is limited, we send a special request to all of our San Diego Permies to consider opening their house/yard (rooms, couch, or tent space) for out-of-town permies. You can charge $ 10-30 and donate part of the income to the Southern California Convergence Funds. Please see under "Forums" for requests/offers of hospitality. Your organic produce, jams, seeds, cuttings, recipes, clothes, books, anything you want, for free! You will have plenty of time to mingle with fellow permies! If you have sustainable/organic items or services in line with permaculture you would like to sell, please contact us at michelle@edgeandelement.com. We support like-minded businesses! Bring your own plate/silverware, bring your own foldable chair and of course, bring your own brilliant vision please. There will be children's tickets available for sale for $10 for kids 5+, kids under 5 are free, but will require adult supervision at all times. We will be holding workshops for children 5+, but they must have an adult companion to help. We encourage you to carpool. Please find carpooling requests and offers under "Forums." Can't Wait till the 9th? Join us on the 6th thru the 8th! 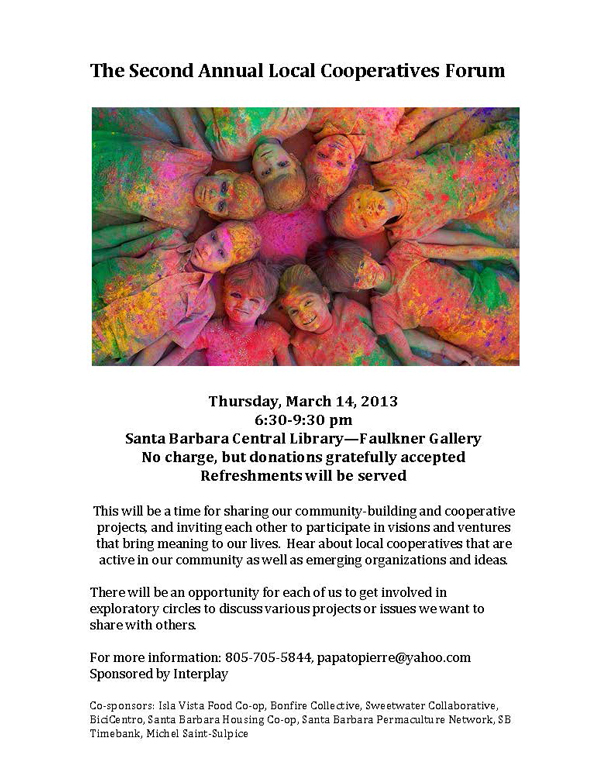 Santa Barbara Public Library, Faulkner Gallery. 40 E. Anapamu St, 9310. No reservations required. For more info: (805) 962-2571, margie@sbpermaculture.org. 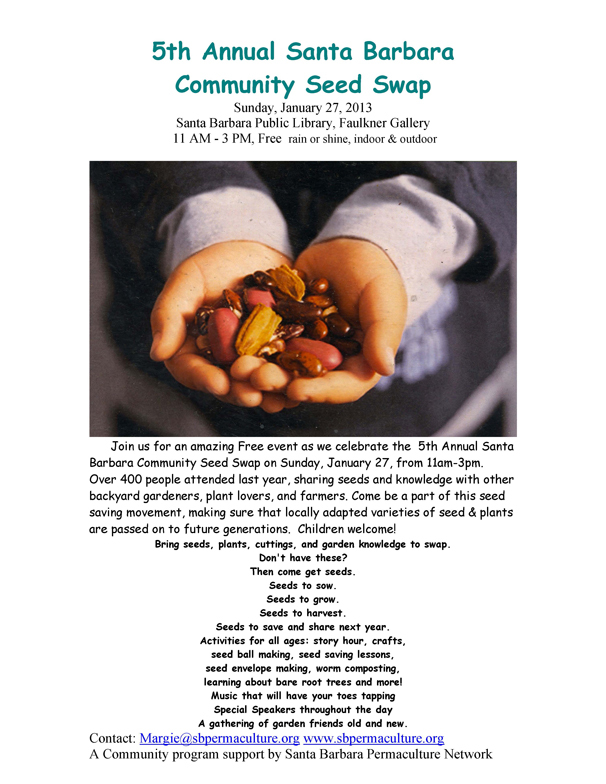 Join us for an amazing Free event as we celebrate the 5th Annual Santa Barbara Community Seed Swap on Sunday, January 27, from 11am-3pm. Over 400 people attended last year, sharing seeds and knowledge with other backyard gardeners, plant lovers, and farmers. Come be a part of this seed saving movement, making sure that locally adapted varieties of seed & plants are passed on to future generations. Children welcome! Special speakers, children activities, seed ball making, scion demonstration & music. The Lexicon of Sustainability Exhibit will also be on display. Bring seeds, plants, cuttings, and garden knowledge to swap. Seeds to save and share next year. learning about bare root trees and more! A gathering of garden friends old and new. Special thanks to Island Seed & Feed http://www.lexiconofsustainability.com/images/ who have generously supported the Annual Santa Barbara Community Seed Swap every year with donations. 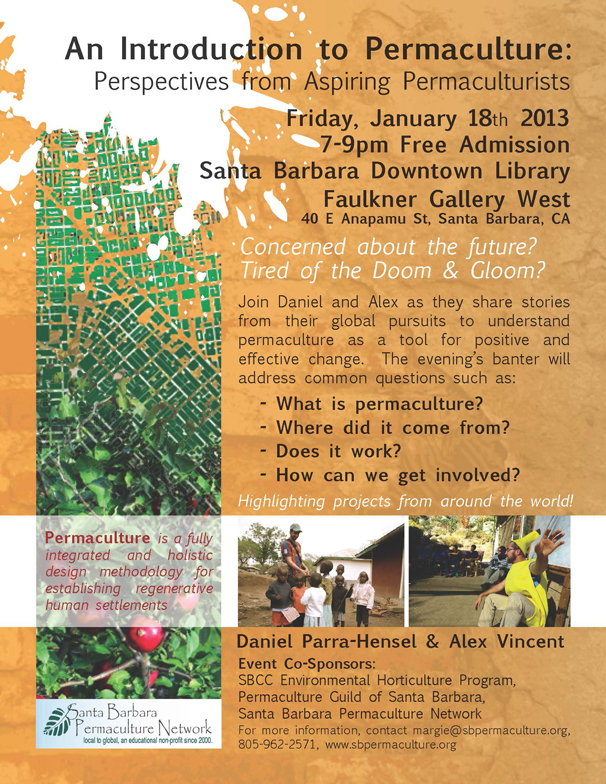 A Community Event supported and organized by Santa Barbara Permaculture Network. Santa Barbara Central Library, Faulkner Gallery-West. 40 E. Anapamu St, 93101.
:: Where did it come from? :: How can we get involved? and will highlight inspiring projects from around the world. Permaculture is a fully integrated and holistic design methodology for establishing regenerative human settlements. Founded by Australian biologist Bill Mollison and his then student and co-originator David Holmgren in the late 1970's, Permaculture is fast becoming one of the most effective design methodologies for attaining sustainability worldwide. Permaculture is now in 160 countries with an estimated 850,000 grassroots projects on-the-ground, feeding more people than all the world food aid organizations combined. Daniel Parra Hensel is a rising young Permaculture designer and teacher. Currently the Program Coordinator for the Sustainable Vocations program, a highly acclaimed three week residential Permaculture Design Course for youth at Quail Springs Learning Oasis & Permaculture Farm, Daniel has also been a teaching assistant for Quail Spring's Permaculture Design Course, and its three month Apprenticeship Program. He recently assisted with international development and education projects in both Kenya and Uganda. A graduate of the world-renowned internship program offered by the Permaculture Research Institute of Australia, Daniel is currently an Environmental Horticulture major with an emphasis in Restoration Ecology at Santa Barbara City College where he co-teaches the SBCC Permaculture Design Course. While a student Daniel hopes to contribute to the emerging Permaculture movement in academia. Alex Vincent just completed his final year of undergraduate architecture studies at Cal Poly San Luis Obispo. Alex's design thesis work, titled Polytechnic Permaculture, forged new headway in presenting Permaculture as a model for the natural evolution of American Universities. Alex created the Poly Permaculture Club at Cal Poly and has designed and collaboratively implemented many gardens ranging in scale from urban backyards to rural landscapes in and around San Luis Obispo, CA. Alex's primary passion lies in collaborative design strategies and Permaculture education. His background includes participating in and mentoring for the Sustainable Vocations program at Quail Springs as well as completing the ten-week internship at the Permaculture Research Institute of Australia. . He is currently striving towards the establishment of a Permaculture design-consultation business and building his experience as an educator. He will be assisting with the upcoming Spring Semester Permaculture Design Course taught annually at Santa Barbara City College. Event Co-sponsors: SBCC Environmental Horticultural Program, the Permaculture Guild of Santa Barbara, the Quail Springs Sustainable Vocations Program.